Every year Heathrow extends a warm welcome and a fond farewell to millions of passengers as they arrive and depart through the airport. We have recruited a team of volunteers who help make every journey better for our passengers. 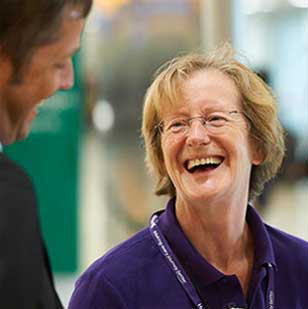 Heathrow Volunteers provide additional support to our terminal operational teams, ensuring our passengers receive additional care whilst travelling through the airport. In addition to this Heathrow Volunteers assist with major events including The London 2012 Olympics and Paralympic Games, the opening of the new Queens Terminal 2, the UEFA Champions League and the Rugby World Cup. The volunteers are also an integral part of selected charity events at Heathrow such as Marie Curie, Children in Need and the Poppy Appeal. There are lots of exciting reasons to be a part of our team. Our volunteers are passionate, enthusiastic, energetic, and get a real sense of satisfaction from helping people. They come from far and wide to be a part of this unique experience and our volunteers receive comprehensive training to allow them to become 'Heathrow Champions'. You might be welcoming athletes to sporting events, helping families get their holiday off to a great start or looking after our frequent flyers. Our volunteers are people like you and they help all these people. There is also the sense of pride that comes with knowing you're a valuable member of the Heathrow Team. Have you been helped by one of our Volunteers? Have they made a difference to your journey? Or if you simply have feedback on the Heathrow Volunteering scheme, then we would love to hear from you - please use the link below to let us know your thoughts.